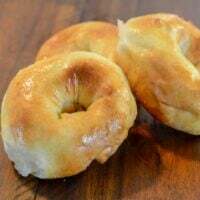 Air Fryer 2 Ingredient Weight Watcher Friendly homemade Bagels. No yeast, no boiling, and they are done in a hurry. Best of all these 2 ingredient bagels are Weight Watchers friendly! These Air Fryer bagels are simple to prepare and are packed full of protein (thanks to the Greek yogurt) and a nice breakfast or mid-day snack. 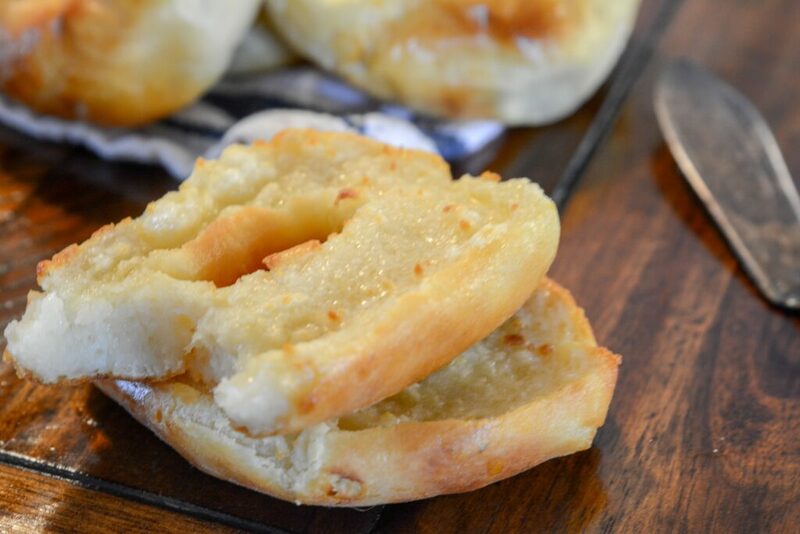 These 2 ingredient bagels taste amazing straight out of the Air Fryer! Or if you own a Ninja Foodi you can use the crisping option to make these bagels as well. I have debated making bagels in the past, but waiting for the dough to rise, then boiling, followed by baking seemed a little tedious. When I came across the 2 ingredient bagel idea, I knew it was something my husband and I would love. Tender, soft, and delicious bagels in a fraction of the time! Just remember when you are baking these bagels, they will expand as they bake. Make sure to leave room between them in the basket so they don’t touch. If the bagels do touch they will not cook up properly. You have to use greek yogurt. 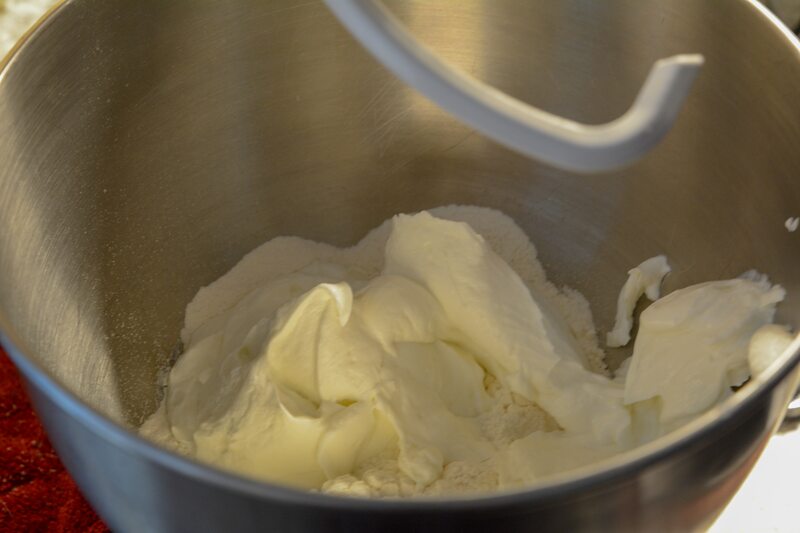 The thickness of the Greek yogurt is what helps the dough form properly. Fage and Stonyfield Greek are both great options. You might find an off-brand of Greek that could work well. Make sure to play with the dough. If it is too wet add more flour, do stiff, add more yogurt. 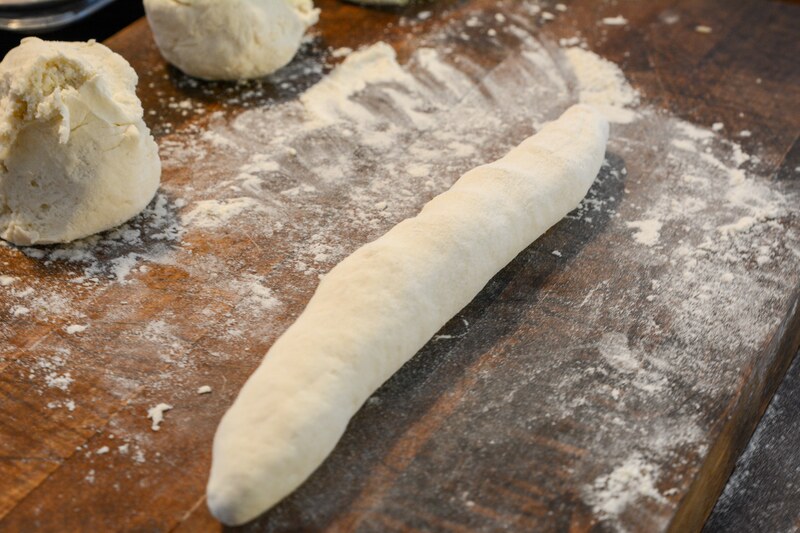 The dough is something that needs to be worked with to ensure you get the right consistency. Reach for Self Rising bread flour. This will help your bagels rise as they bake. If you use a different type you will find your bagels will end up flat. You can double or even triple the bagel recipe. It is so easy to do, and you will just have to batch cook your bagels of course. You can also decrease the amount by half if you only want to make a few bagels! 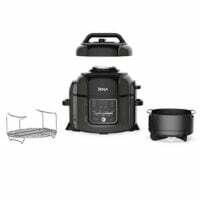 Ninja Foodi/Airfryer blooming onion, Air Fryer Egg Rolls, and Air Fryer Buffalo Wings. Once you are done cooking your bagels, allow your bagels to cool down on a cooling rack. Once cooled place in an airtight container or freezer bag and toss in the freezer for up to 3 months. When you want to reheat, just allow them to thaw on the counter, or nuke them in the microwave. You can wrap up your bagels and place in the fridge for up to 3 days. After that, you will find they begin to dry out and go bad, at which time you need to toss them out. You can toast your bagel in the air fryer. Turn fryer to 370 degrees and slice and bake for 3 minutes. Remove bagel, add a dollop of butter, and then place back in air fryer for another 2-3 minutes. Then pull and enjoy! 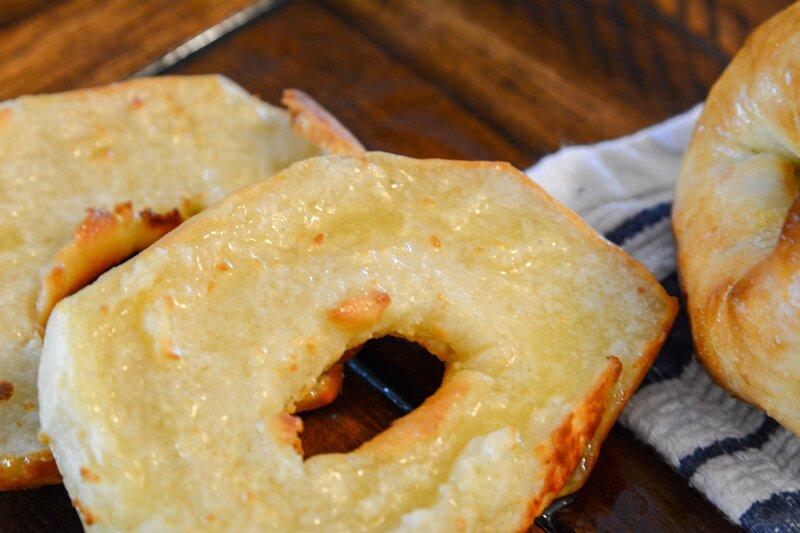 Do these Air Fryer bagels sound like a good breakfast or snack? 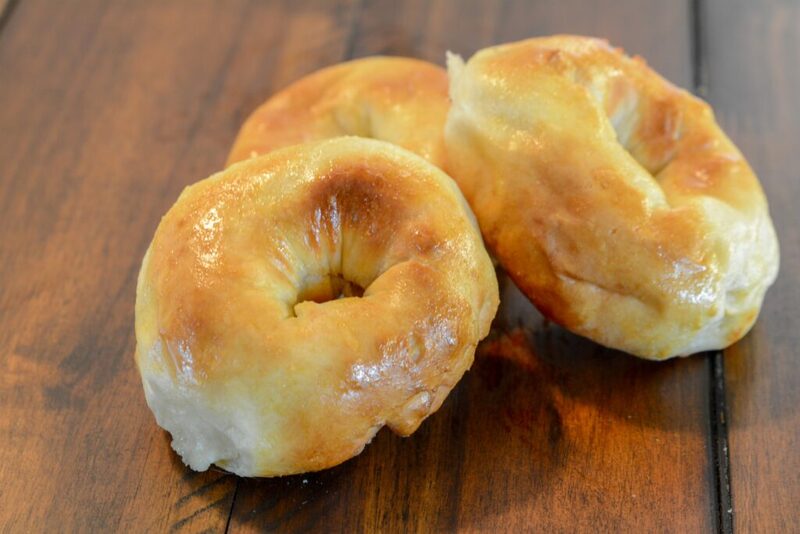 Air Fryer 2 Ingredient Bagels are as easy as it gets to making homemade bagels. No yeast, no boiling, and they are done in a hurry. Best of all these 2 ingredient bagels are Weight Watchers friendly! 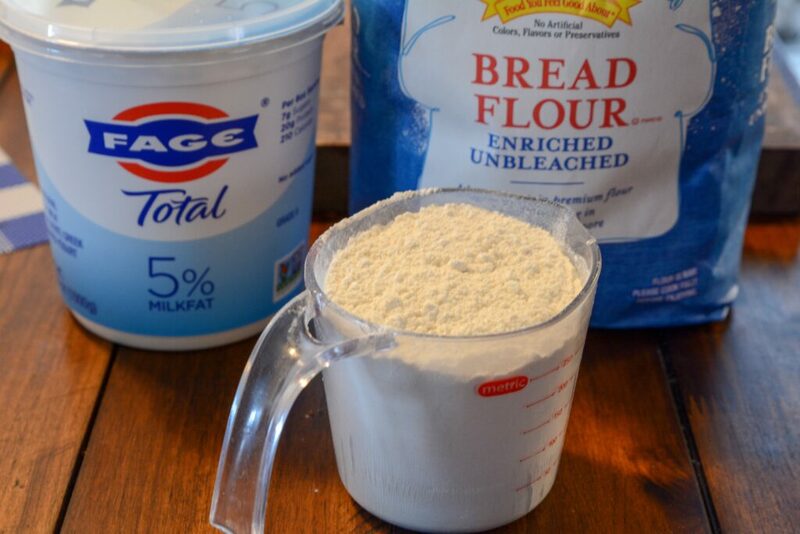 Mix together yogurt and flour until becomes a ball of dough. Place ball of dough on a flat dry surface and cover with flour. Shape into a bagel form. 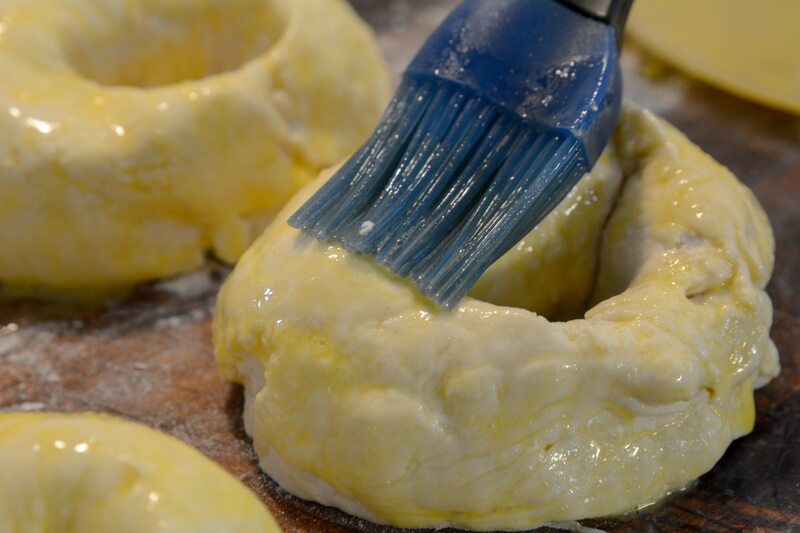 Coat each bagel with an egg wash and any toppings. Place on 350 for 10 minutes.